It’s easy to get worried about stuff, especially swine flu, also known as the H1N1 virus, a virus, that’s facing the world, and has been for long time. Swine flu, a virus, also known as the H1N1 virus, is scary, and bad. We don’t know a lot about swine flu, that is, H1N1, but swine flu is a bad virus, and most people do not want to get it, so it seems. 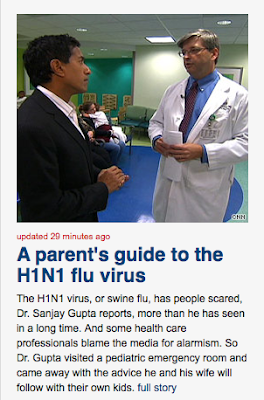 It’s important that Dr. Sanjay Gupta, CNN’s doctor, is investigating this flu, so that we know more things about it, and find different ways to not get it, and HOLY CRAP DOES ANYBODY PROOFREAD CNN’S FRONT PAGE BLURBS FOR EXCESSIVE COMMAS AND CLUNKY, SIMPLETON, RUN-ON SENTENCES?